Indian women place rocks on a fire to heat them for use in the earth oven. Painting by Charles Shaw. 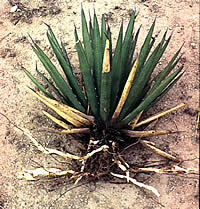 Many fibrous, thorny-leafed plants such as sotol, agave, yucca, and lechuguilla (shown above) were an important food source for prehistoric people. The edible partthe "heart," or leaf baserequired long, slow cooking which was done in earth ovens. Cooked lechuguilla could be stored by scraping off the sugary food from the leaves and forming a patty like the one shown here. Click to learn more. 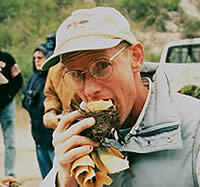 These odd-looking things are the remains of prehistoric meals, found in the dry caves of southwest Texas! Click to learn more. Hot rock cooking? That's right! It's a very efficient technique developed thousands of years ago for preparing large quantities of food that require long, slow cooking. In fact, underground earth "ovens" are still used in some areas of the world today. First, shallow holes or pits were dug in the ground. 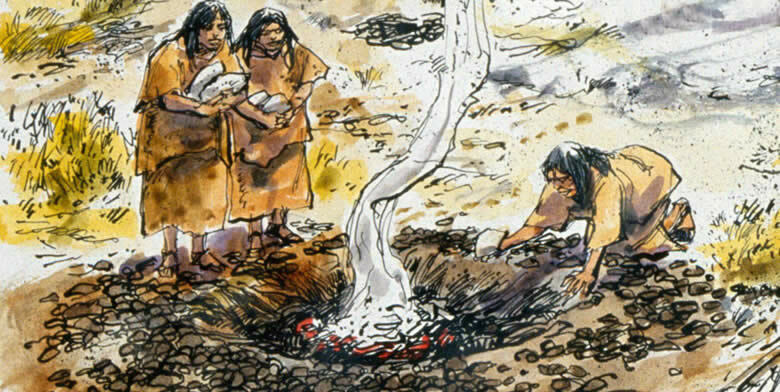 Then a fire was built in the pit and large rocks such as limestone or basalt were added on top of the burning wood and coals. After several hours, the rocks would be so hot, they glowed, reaching temperatures of over 750 degrees! Then a layer of green plants such as wet grass or prickly pear pads was added, then the food (such as sotol bulbs), then a another layer of green plants. The green plants provided moisture (steam) and kept the food from burning and getting dirty. The whole heap was then covered with a thick layer of dirt that served as a lid to hold in the heat. Some foods would be kept in the oven for two to three days before they were ready to eat. The heated rocks stored and slowly released heat (energy) and allowed prehistoric cooks to conserve fuel. Slow cooking also turned bulbs and root foods into sweet nutritious meals. Indians would cook the bulbs and stalks of plants such as lechuguilla, agave, sotol, and wild onions which, when raw, were practically inedible or even poisonous. Some meats were also roasted in earth ovens, but for much shorter times.